= Benkou shisugi de otsukare gimi nanjanai? = Aren’t you a little tired ’cause you studied too much? = Muri shigachi dakara te wo nuite yareba iindayo. = I know you tend to work too hard. You should just take it easy. Today’s guest teachers are these beautiful cats, Levo and Nao. They both worry about you because you have been studying too hard and look a bit tired. Hello! Levo here! I am back! Today I have my buddy, Nao. 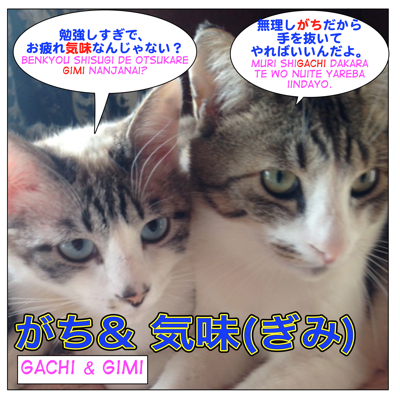 We will teach you how to use がち ( = gachi) and 気味 ( = gimi). Some of Maggie Sensei’s Twitter followers today asked what the difference between these two is. They are similar, but there are some differences. Let’s take a look. 気味 ( = gimi) tends to be combined with non-volitional verbs. 2) Next drop the ます( = masu) ending and replace it with 気味 ( = gimi). Compared to ～がち ( = gachi), the words that you can use with 気味 ( = gimi) are limited. = I have a light cold. = Benpigimi nanode youguruto wo tabeyou. = Since I have been having a touch of constipation, I am going to have some yogurt. 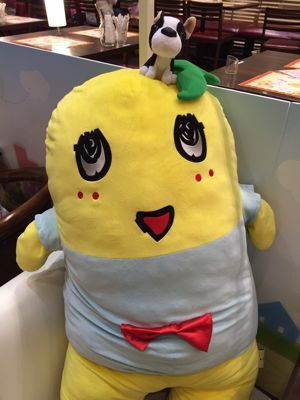 = Funasshii ni atta to kodomotachi wa koufun gimida. = Children were somewhat excited saying they got to see “Funasshii”. = Shiken ga chikaku nari shoushou aserigimi desu. = The exams are getting closer, and I feel a bit pressed. = Kare wa yasegimi daga ooguidaikai de yuushou shitarashii. = He is rather thin, but I heard he won the competitive eating contest. = Shinjin shain wa kinchou gimi ni aisatu ni kita. = The new employee came to greet me somewhat nervously. Some comedians have started to use this word and we hear it more and more often on TV. = Ano shinjin wa kuigimi ni shitsumon shite kuru. = The newcomer cuts me off and asks me questions without waiting for me to finish talking. Note: がち ( = gachi) often used with volitional verbs. = Isogashii to taisetu na koto wo wasuregachi ni naru. = When you are busy, you are apt to forget something important. = Pasokon no tsukai sugi de mega tsukaregachi desu. = I’m on the computer too much so my eyes tend to get tired. = Rasshu awaa wa basu ga okuregachi da. = The buses are apt to be late during the rush hour. = Yoru wa warui koto wo kangaegachi nanode asu no asa, mata hanashiaou. = We are apt to think bad things at night so why don’t we talk about it tomorrow morning. = Karushiumu ga fusoku shigachi na hito wa gyuunyuu wo mainichi nonda hou ga ii. = People who are lack of calcium should drink milk everyday. = Shokugo wa nemuku naru node misu shigachi ni naru. = We get sleepier after having meal and we are apt to make mistakes. = Nihonji ni arigachi na eigo no misu. = Common English mistakes made by Japanese people. = Yuki no hi wa jiko ga okori gachi nanode ki wo tsukete kudasai. = Be careful! The more accidents tend to happen on winter days. = Hitorigurashi dato konbini bentou bakari tabegachi ni naru. = Since I live alone, I am apt to eat more boxed lunches from convenience stores. = Gurei no iro no fuku wa fukete miegachi ni naru. = Gray is likely to cause you look older. = Kuufukuji wa kigen ga waruku narigachida. = When I am hungry, I am apt to be in a bad mood. = Hito wa seikou suruto unubore gachi ni naru. = People tend to be stuck up if they succeed. = Zutto kumorigachi no tenki ga tsuzuite iru. = It has been cloudy for a long time. = Otouto wa kodomo no koro kara byouki gachi datta. = My younger brother has been prone to illness since he was a child. = Kare wa enryo gachi ni doa no ushiro ni tatte ita. = He was standing behind the door modestly. Now, let’s see the confusing ones. 気味 ( = kimi) means “slightly something” and it expresses the current state or condition. がち ( = gachi) expresses some tendency. So this person is not necessary fat now but he/she gains weight easily. = Saikin, futori gimi dakara ki wo tsukenakutewa ikenai. = I am on the fat side (I am kind of fat) now so I have to be careful. = Saikin, futori gachi dakara ki wo tsukenakutewa ikenai. = I’ve been putting on weight recently so I have to be careful. 疲れ気味 (= tsukare gimi) means “feeling a little tired (now)” and it describe one’s current condition. 疲れがち ( = tsukare gachi) is “to be apt to get tired” and you use it when you find yourself often get tired easily. = Tsukaregimi dakara bitaminzai ga hoshii. = I am feeling a bit tired lately so I want some vitamins. = Saikin, tsukare gachi nanode bitamin zai ga hoshii. = Recently I’ve been getting tired easily so I want need some vitamins. = Ressun wo tsukutte iru to tsui jikan wo wasuregachi ni narimasu. = When I make lessons, I am apt to forget about time. = Saikin, suimin busoku gimi nanode mou nemasune. = I haven’t been getting enough sleep so I will go to sleep now. = Tenshi wa rakudato omowaregachi desuga, chanto oshigoto mo shiteimasuyo. = You might think being an angel is easy, but I have been doing my work diligently. Are all of the followings possible? What is the stand out thing of 気味 ? How about the nuance of 緊張気味 and 彼は少し緊張している? They sound the same to me…. But..is there any difference here? They more or less mean the same. There is a word ~する／Verb dictionary form + 傾向（けいこう）がある but it sounds too formal for your example sentence. Thank you for this lesson! I find it easy to understand, especially your explanation for 気味. I do wonder why many books and websites give the meaning of 気味 as “tend to” / “seems like”. Yes, it could be translated “tend to” as well. I think I included that translation in the lesson as well. Hello Maggie. I’m a little confused by your reply. Yes, I read in the lesson that verb masu stem + がち = tend to do something. What I meant in my first comment is that many websites and books also translate verb masu stem + 気味 = tend to / seems like. That makes it difficult to understand the difference between がちand 気味. Do you mean in your reply that 気味 also means “tend to”? I don’t know how other sites or book explain. It could be just a translation problem and certain cases, you may able to use “tend to! but when you describe the current condition “slightly/a bit ~” would fit better, I think. Thank you very much Maggie sensei. Your lessons were too hard for me when I began learning Japanese, but now I really appreciate the numerous examples you provide. in this sentence つい implies unintentionality (pattern つい～がちになる tells us, that the action [= the tendency to forget about time] has been done unconsciously). It is good not to translate つい in this case. Let’s say that adds more emphasis to ～がちになる. I know my lessons can be really difficult for the beginners but I am glad you still come here. Or when you do something and get too involved and can’t control it. Hii~ I love this site, you’re so great! = Hangarii ni zehi kite kudasai. Kitto kini iru to omoimasu. How come in the example in the introduction it’s 勉強し すぎで sugide and not　勉強し　すぎてsugite? ありがとう！！I am happy to hear you learned something new here. = Kuufukuji wa [kinge]/ [kigen]ga waruku narigachida. Thank you for spotting the typos. I fixed them. = My younger brother has been prone to illness since [he was a job] [he was a kid]. Oh, very good lesson! I don’t even have any questions about it. Thank YOU for the first comment!